Last month a friend added me to a facebook diet group, about Ketogenic. Ketogenic diet is low carb and high fat diet. So the group members show off their meals including meat, cookies, some of them even including deep fried foods. I looked into Wikipedia and knew that Ketogenic was created originally for paediatric epilepsy.In adults, common side effects include weight loss, constipation, raised cholesterol levels and, in women, menstrual irregularities including amenorrhoea. You can see it helps lose weight, that's why many people go for it. I'm not judging any diet, but my advice is to go for balanced diet. Weighloss doesn't equal health. Any low-carb diet tends to cause menstrual irregularities including amenorrhoea. Young ladies, especially those who are planning to have a baby must take enough carbohydrate, healthy carbohydrate. According to Five-Phase theory, whole grains(good carbohydrate) belong to Earth elements. Earth-Mother breed life. No earth, no life in nature. Some girls didn't eat enough carbohydrates in order to lose weight and then caused amenorrhoea. But they recovered quickly once they resumed eating carbs. Below macronutrient proportion is from Dietary Guidelines for Americans, 2010. We'd better keep this proportion every day. In TCM healthcare practice, human body constitution is very popular. Knowing constitutional body type help us adjust daily life accordingly. Body Constitution refers to the relatively stable characteristics in morphology, psychology and physiological function. It’s the manifestation of the functional state of the internal organs, demonstrating the condition of qi, blood, yin and yang in the body. Body constitution is formed before birth and can be improved after birth. The congenital base of constitution influences the whole life of a person. However, living a healthy lifestyle can improve our body constitution close to the healthy type ; Poor lifestyle may worsen or even develop a weak constitution, leading to chronic disease. There are different ways to divide constitution in TCM such as classification according to yin and yang theory, five elements theory, viscera, qi, blood and body fluid, etc. Nine-body-constitution is widely used in clinical practice. China Association of Traditional Chinese Medicine (CACM) issued a standard for it in 2009. Of all the nine types of body constitution, most people manifest one dominated type mingled with other one or two types. Very few people are featured by one single type. Check details here. 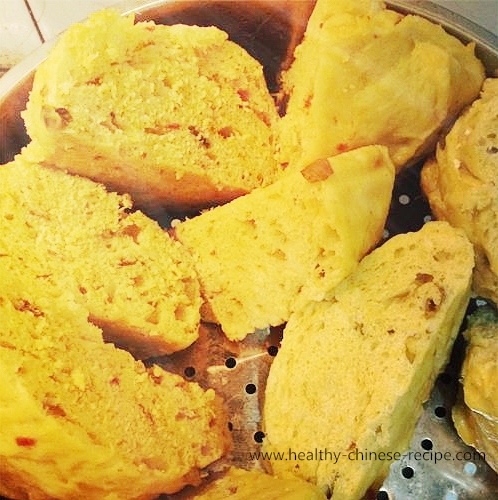 Recently my family are making an amazing new food- Steamed Pumpkin Cake. It seems that we are celebrating a festival each time we cooked and tasted. Because it's so so delicious!